I have been trying to stay away from sugar, which has been kind of hard since I have such a sweet tooth. I grew up baking, and enjoy sitting down with a nice cup of green tea and a slice of cake. But ever since I got in on the healthier lifestyle, I have been cutting down. I got to the point where dessert is a treat at the end of the week. 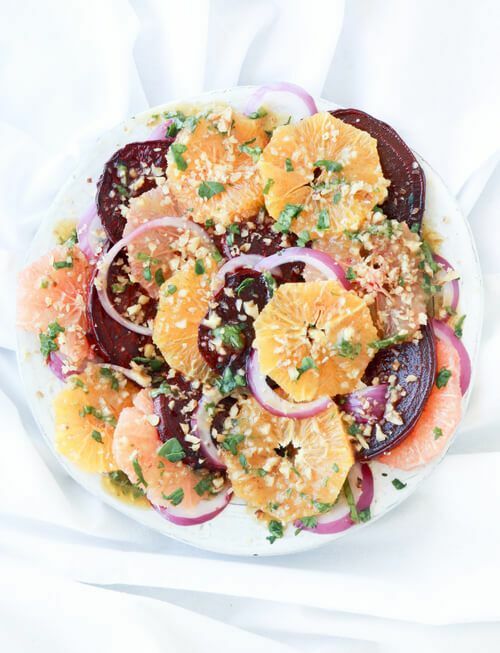 To help with my sweet cravings, I made this beet and citrus salad. It has a combination of sweet and tangy, not just in the dressing, but also as the main salad ingredients. As always, health benefits are in full abundance in this recipe. The beets are low in calories but high in nutrients such as fiber, vitamin C, and folate. The citrus fruits are rich in vitamin C, potassium, folate, and vitamin B6. Dressing: Whisk together dressing ingredients, set aside. Cover a baking sheet with foil. Spread sliced beets on the foil. Roast for 30 minutes, or until beets are tender. Cool down. Arrange orange, grapefruit, beet, and red onion on a plate. Drizzle dressing on top and sprinkle with walnuts.